Background: Recently, single port access laparoscopic surgery with transumbilical approach has been widely adopted by emphasizing an excellent cosmetic advantage as innovative features in minimally invasive surgery. 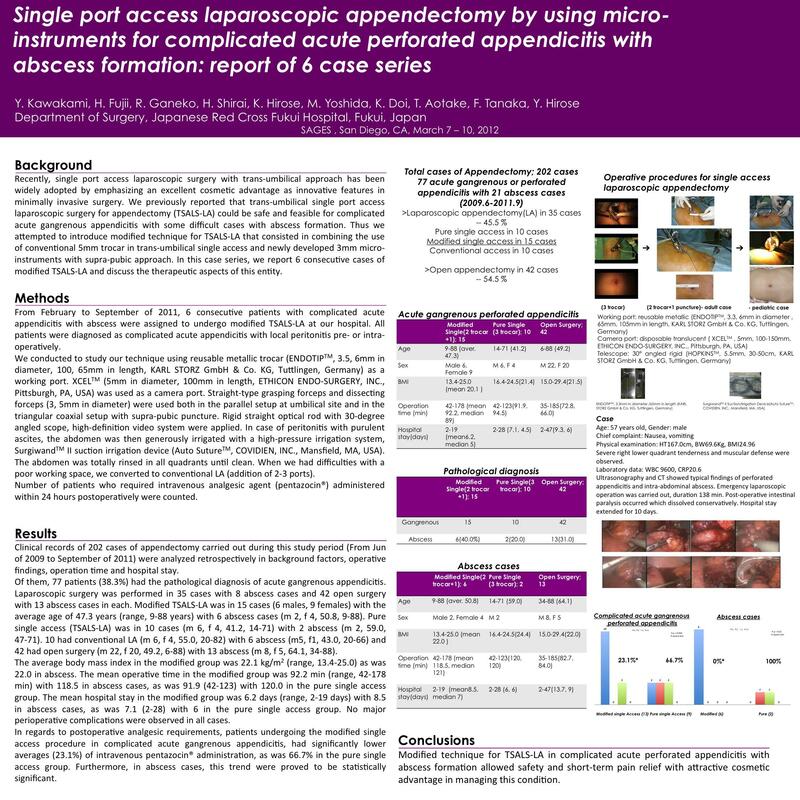 We previously reported that transumbilical single port access laparoscopic surgery for appendectomy (TSALS-LA) could be safe and feasible for complicated acute gangrenous appendicitis with some difficult cases with abscess formation. Thus we attempted to introduce modified technique for TSALS-LA that consisted in combining the use of conventional 5mm trocar in transumbilical single access and newly developed 3mm micro-instruments with supra-pubic approach. In this case series, we report 6 consecutive cases of modified TSALS-LA and discuss the therapeutic aspects of this entity. Patients and methods: From February to September of 2011, 6 consecutive patients with complicated acute appendicitis with abscess were assigned to undergo modified TSALS-LA at our hospital. We conducted to study our technique using reusable metallic trocar (ENDOTIPTM, 3.5, 6mm in diameter, 100, 65mm in length, KARL STORZ GmbH & Co. KG, Tuttlingen, Germany) as a working port. XCELTM (5mm in diameter, 100mm in length, ETHICON ENDO-SURGERY, INC., Pittsburgh, PA, USA) was used as a camera port. Straight-type grasping forceps and dissecting forceps (3, 5mm in diameter) were used both in the parallel setup at umbilical site and in the triangular coaxial setup with supra-pubic puncture. Results: Clinical records of 202 cases of appendectomy for acute appendicitis carried out during this study period (From Jun of 2009 to September of 2011) were analyzed retrospectively in background factors, operative findings, operation time and hospital stay. Of them, 77 patients (38.3%) with 21 abscess cases (13.4%) had the pathological diagnosis of acute gangrenous or perforated appendicitis. Laparoscopic surgery was performed in 35 (8 abscess) cases and open surgery was in 42 (13 abscess). Modified TSALS-LA was in 15 cases (male 6, female 9, average age 47.3 years, range 9-88) with 6 abscess cases (m 2, f 4, 50.8, 9-88). Pure single access (TSALS-LA) was in 10 cases (m 6, f 4, 41.2, 14-71) with 2 abscess (m 2, 59.0, 47-71). 10 had conventional LA (m 6, f 4, 55.0, 20-82) with 6 abscess (m5, f1, 43.0, 20-66) and 42 had open surgery (m 22, f 20, 49.2, 6-88) with 13 abscess (m 8, f 5, 64.1, 34-88). The average body mass index in the modified group was 22.1 kg/m2 (range, 13.4-25.0) as was 22.0 in abscess. The mean operative time in the modified group was 92.2 min (range, 42-178 min) with 118.5 in abscess cases, as was 91.9 (42-123) with 120.0 in the pure single access group. The mean hospital stay in the modified group was 6.2 days (range, 2-19 days) with 8.5 in abscess cases, as was 7.1 (2-28) with 6 in the pure single access group. No major perioperative complications were observed in all cases. Conclusions: Our cases could confirm the safety and the attractive cosmetic advantage of modified TSALS-LA for complicated acute perforated appendicitis with abscess formation as a promising option in managing this condition.